We are extremely pleased to announce Smartcomm has won the Crestron Global Home Technology Award 2019, for our project on the utterly stunning Centre Point Residences. 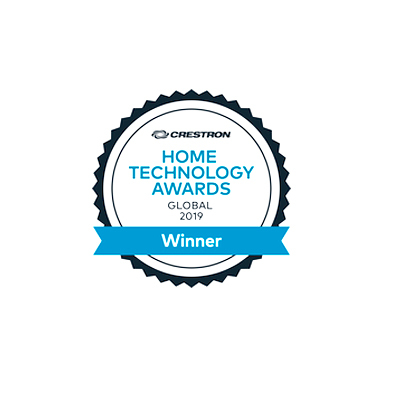 Receiving a Crestron Global Home Technology Award is no small achiemvement. The Crestron Global Home Technology Awards recognize the most innovative and jaw-dropping smart home projects worldwide. They represent true excellence in control and home automation, and solutions that exceed customer expectations. Centre Point Residences is an iconic development set literally and figuratively in the cultural heart of London, at the point where Tottenham Court Rd and Oxford Street connect. Originally constructed in 1966, it is comprised of a 34-storey tower and a 9-storey block to the east. This brutalist masterpiece was designed by Richard Seifert and engineered by Wilem Frischmann and started life as an office block. Almacantar, the developers, have transformed this sky scraper into a stunning, super-prime residential development and gastronomic centre for London. The final piece of the redevelopment of the site will be the opening of central London’s first new public square for a generation – St Giles Square. At the very top of the building, there is a fabulous, deluxe, duplex penthouse, with a wrap-around balcony for perfect city views. The rest of the development houses a number of gorgeously appointed 1, 2 and 3-bedroom apartments plus an unrivalled choice of luxurious shared amenities for residents. In the Club, there is a lounge, private dining room and a screening room. The first floor spa boasts a 30m pool, treatment room, sauna and steam room. For further information you can head to the Centre Point Residences website by clicking here. We would like to thank all those at #Almacantar for their help and support and to #Crestron for honouring us with a Crestron Global Home Technology Award. We would also like to congratulate #CliveMosby and all those involved in the project and award submission at Smartcomm.